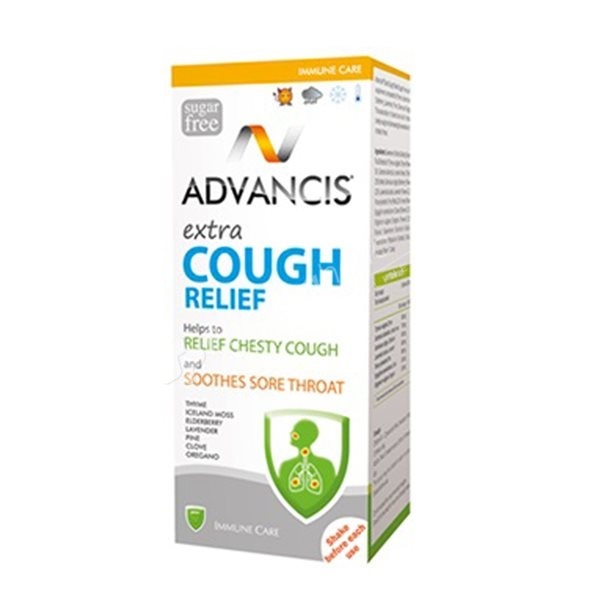 Advancis Extra Cough Relief Sugar free is a food supplement composed by thyme, Iceland moss, Elderberry, Lavender, Pine, Clove and Oregano. This association of plants is an aid in relieving chesty cough and decreasing the sensation of an irritated throat. Children 6-12 years old: take 1 teaspoon (5ml) 3 times daily. Adults: take 1 dessert spoon (10ml) 3 times daily. The syrup may be diluted in water or juice. Sweetener: Sorbitol; Gelling: Glycerin; Fruit Extracts of: Thymus vulgaris, Thyme (flowers) 3%; Cetraria islandica, Iceland Moss (Thallus) 2,5%; Water; Sambucus nigra, Elderberry (flowers) 2,0%; Honey flavour; Syzygium aromaticum, Cloves (flowers) 0,5%; Origanum vulgare, Oregano (flowers) 0,5%; Flavour; Sweetener: Saccharin Sodium; Preservative: Potassium Sorbate, Sodium Benzoate, Propyl Galhate.